ON AIR flex and NEXUS Base Devices streamline 5.1 international audio mix of atmosphere from sports events and booth commentary. The new workstation for 4 ducking workflows with ON AIR flex in the multi-mix studios at RTS. In the 25 years since Stage Tec was founded, many customers have given the impetus for new products or features, with Stage Tec commissioned to implement them in the audio equipment. 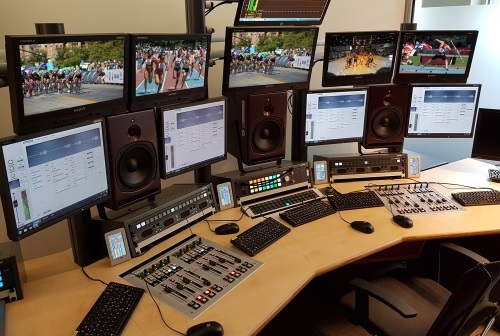 RTS (Radio Télévision Suisse) had the idea for a simple and automated workstation for the most common workflow in sports broadcasts: The 5.1 international audio mix of atmosphere from the sports event and the commentary from the booth. A task for which typical sound control rooms are usually oversized in terms of equipment and manpower. Instead of occupying four control rooms and employing four audio engineers, RTS wanted to design a workstation in such a way that one sound engineer could operate four workflows in parallel. The challenge was that the international audio feed is very different in volume for different sports, for example Formula 1 is much louder than tennis. Usually, the ducking in the mix is controlled with a fixed dim level, because it is only about one sport. However, if several sports are mixed in parallel, then this requires an intelligent ducking which takes each sport into account. This means an automated adjustment to the international audio level with the possibility of manual intervention, since the intention is to create a high-quality sound mix while ducking. In cooperation with BFE, Stage Tec developed a stand-alone application with a connection to a television control room. The workstation is equipped with four ON AIR flex, two NEXUS Base Devices, and four operator computers with RUI. The mixing consoles were given a structured user interface. Instead of a fader and monitor panel, two fader panels were mounted in one tray. 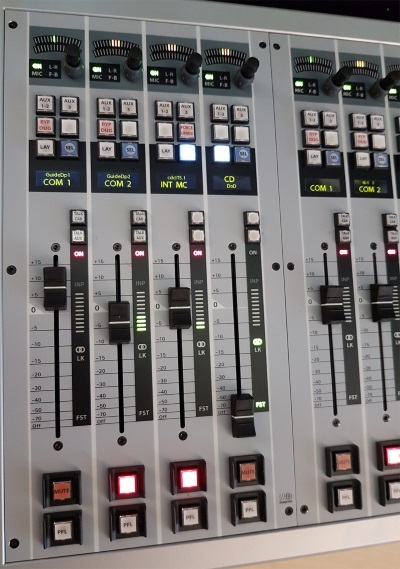 Each ON AIR flex has four faders: two for the commentators, one for the international 2audio and the fourth fader controls the pilot tone rather the volume of an audio signal as is usually the case. This enables manual intervention during the commentary and the ducking attenuation of the international audio signal to be set. “With the small user friendly ON AIR flex we can centralize the automatic mixing of 4 programs in the same place by a single technician. For us, this is the strength of NEXUS: centralization and sharing of resources,” says Yves-Alain Schneider, head of Audio Production Sector at RTS. Stage Tec has realized the concept proposed by RTS innovatively and efficiently. The new DSP function, Multichannel Ducking, in which the ducking depth is controlled by the ON AIR flex fader, demonstrates the great potential of the NEXUS system. The workflow created here is suitable for all TV stations with sports programs.